Brahmasri Paruthiyur Krishna Sastri a pioneer of Hindu Religious discourses had traveled all over India and had conducted discourses in various subjects spreading the knowledge. 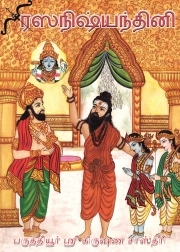 He was considered the greatest exponent of the Ramayana in his time whose style is even now revered and emulated. Sastri's life was dedicated to renovating and maintaining temples, building temples for Sri Rama, philanthropy, singing and talking about the glories of the story of Sri Rama thereby inducing bhakti and dharma in his large audiences. Sri Rajkumar Bharathi, the great grandson of great renaissance poet Mahakavi Subramanya Bharathi is an electronics and telecommunication engineer who had turned to music as a full time career. He is currently the visiting faculty for carnatic music at Bharatiya Vidya Bhavan, London. He is also a composer, teacher and a writer, who has many cassettes and CDs to his credit including a unique rendering of all the 18 chapters of the ‘Srimad Bhagavad Gita’, in four volumes produced by Ramakrishna Math. He had penned lyrics and has been the music composer / director for several music and dance albums and ballets. As a writer he had translated a book ‘Timeless In Time’ based on Sri Ramana Maharishi's life and teachings written by Sri A. R Natarajan into Tamil titled ‘Kalamatrathin Kalam’ published by Sri Ramana Maharishi Centre for Learning, Bangalore.